Update, January 6, 2015, 23:30: Alongside Fitbit’s new fitness super watch, company also announced the Fitbit Charge HR, the wristband that is more in-line and design with the new kinds of fitness band in the wearables market. First details about this device were leaked last year in October, but now it has been launched at CES today at a price tag of $149.95. Starting today, the new Fitbit product is available on company’s website as well as on various e-retailers. The Charge HR touts the heart rate sensor that comes equipped on the device. It motivates users to maintain workout intensity and monitors calorie burn. The device features a bright OLED screen, which shows you day-long stats and continuous heart rate tracking with steps, distance, floors climbed, calories burned and time spent exercising. It is a usual fitness tracker with extraordinary excellence of being a quality Fitbit product. The Charge HR has exercising mode, which records your workouts and give out real-time exercise stats, detailed summaries, and hear rate insights. Moreover, it also monitors sleep quality and work like caller ID for notifications like texts, calls, etc. The device is water resistant and has comfortable texture and secures tightly with the metal clasp. It will be available in four colors options, black, plum, blue and tangerine (two are coming later). Earlier, Oct 15, 2014, 13:11: Fitbit was reported to launch two new fitness trackers in the coming weeks, but looks like we would have an earlier preview of what those fitness bands would be like, as the information about the device has been leaked. If you have been waiting for a new hardware from Fitbit, then, it’s good news for you. The leaked document shows that the two new devices will incorporate the design aesthetics of Fitbit Force, while adding number of new features to its list. 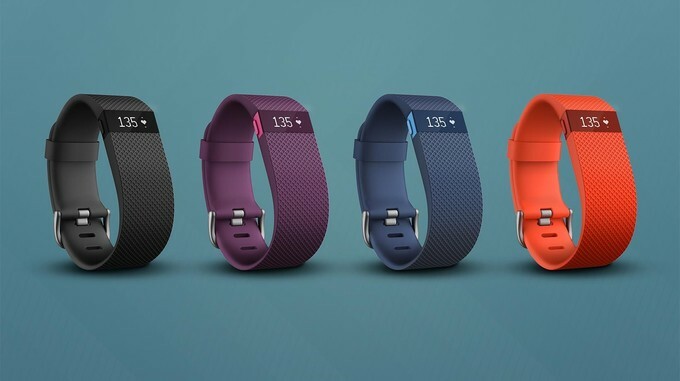 The new Fitbit devices called Charge and Charge HR, will be the next generation of fitness trackers. While the first device will have the same set of basic features that was included in the Fibit Force with few improvements like Displaying stats, time, and caller ID. As well as monitoring sleep quality, silent and vibrating alarm, and will boast a water resistant body. While the more interesting is the Charge HR, which according to the leaked document, will incorporate the heart rate monitoring feature that was previously absent on the any Fitbit trackers. Since, most of the companies are now introducing the heart rate sensors in there devices, it was about time that Fitbit introduce this feature in there trackers. Fitbit Charge HR will boast a PurePulse continuous feature, which will allow the device to constantly monitor your heart rate. As it will allow the wrist band to efficiently track the calories and recommend the cardio training. It also touts the use of MobileRun on the Fitbit App to see the run stats of your training. All in all, the Charge HR is basically the same as Fitbit Charge – which is similar to the Fitbit Force – while adding the bonus of measuring the ticker of your heart all the times, except when it is on charging. The price of the device was not mentioned on the leaked document, but according to the Russian retailer, who has listed these Fitbit devices, has quoted the pricing of Charge as $185, while Charge HR will cost $220. It seems a steep pricing for these two devices considering the fact that Force was much cheaper during launch at $130. It will be interesting to see how much battery life would the Charge Hr gives, as the device would be measuring your BPM continuously.